Back in the day, wagon and delivery services played a significant role in residents' lives. Bread and milk delivery carriages could often be seen on the main and residential streets of Oakville in the early mornings. One of the most popular dairy suppliers was John W. Wilson’s Gilbrae Dairy. Milk and cream were produced on his father’s farm which had been named the Gilbrae Farm. The Wilson family was widely known for their prize herd of dairy cattle. 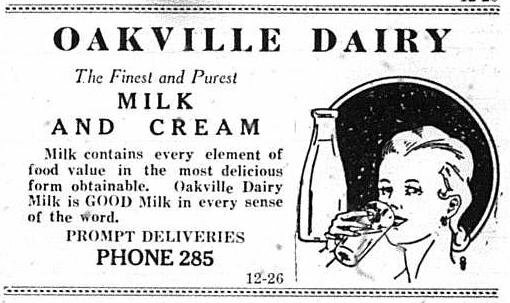 Gilbrae Dairy delivered products to many homes in the Oakville vicinity, supplying residents with a variety of dairy products. In order to signal how many bottles of milk a household wanted to purchase, ‘milk tickets’ were left at the front door. One ticket equaled one bottle of milk, and ten tickets could be purchased for a single dollar – much cheaper than what we now pay for milk! Milk was delivered in heavy-duty glass bottles in order to prevent breakage. The horses drawing the milk wagons for delivery actually began to recognize the organized route so well that eventually they knew exactly which houses to stop at for delivery. Information credited to: Ahern, Frances Robin. 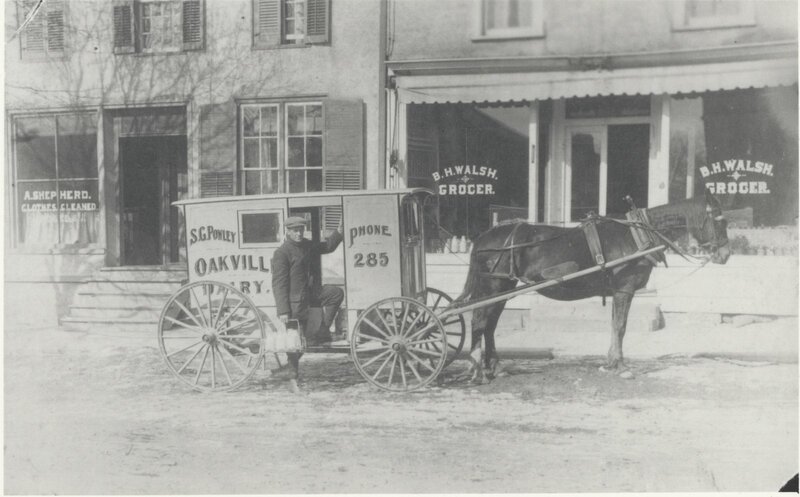 Oakville: A Small Town (1900-1930). Erin, Ont. : Oakville Historical Society in association with The Boston Mills Press, 1981. Print.